A friend of mine posted a photo of the falls downtown and it looked awesome so me and Kelly decided to get together and head downtown to check it out. And we figured since Chili's was doing their kids eat free deal that we might as well do dinner down there after too! Especially when both of our husbands were out of town! We started at the falls and the boys all went crazy for the water. And I almost had a heart attack trying to set some ground rules for Preston with the bridge and the water and keeping him within reach. But I think it's pretty obvious everyone had a good time looking at the water and how full the falls are! 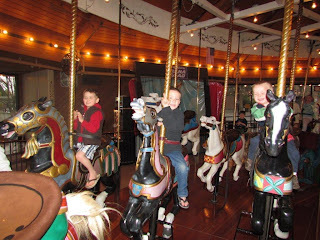 On the way to dinner we passed the carousel so it was decided that the boys had to ride it. So we bought tickets and climbed on. It's such a simple ride and yet all of them were so excited to be on it! When you leave the carousel you pass by the goat. I had forgotten all about the goat. When I was little I used to love feeding him. You push a button next to him and he turns into a garbage sucking machine. It's kind of awesome. Preston had never seen or "fed" the goat before so Zack introduced the two of them. And he loved the goat! 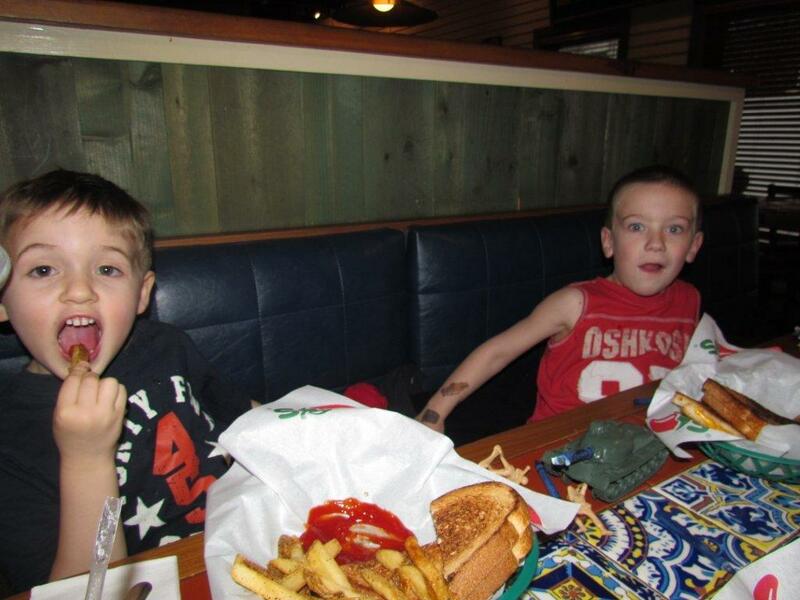 And just because I think it's funny, the boys at dinner! We got home way after dinner but we had fun so it was worth it!